30 students of the Master’s program »Brand and Media Management« (M3ve) and the program’s director Prof. Dr. Karsten Kilian (Markenlexikon.com) visited the Munich-based brand consultancy Blackeight on June 23rd 2017. Together with Manuela Liebertz, Marketing and Brand Management at MAN Truck & Bus, our Brand Sparring Partner Daniel Höpfner and Anna Scheuernstuhl provided insights into brand management at MAN Truck & Bus. After a vivid and exciting discussion, the group visited the MAN factory in Karlsfeld where our guests from Würzburg could experience the implementation of the brand strategy into day-to-day work first-hand. At the end of the day, the group visited the brand architects Schmidhuber & Partner. 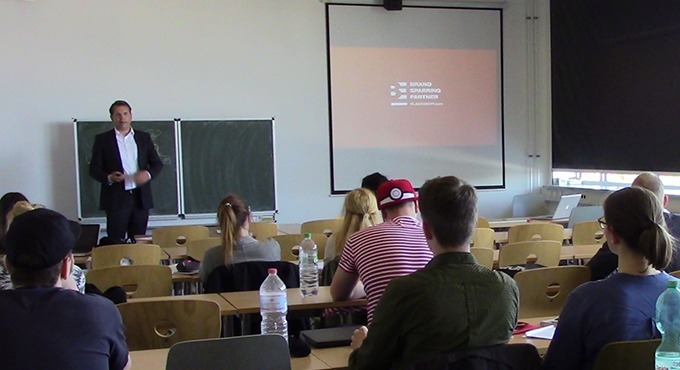 As part of the lecture “Marketing Principles” Dr. Matthias Hüsgen gave a practical lecture on brand management at the Merseburg University of Applied Sciences. Thanks to Prof. Dr. Doreen Pick for the invitation and to the students for the exciting discussion! Last week, Kathrin Rothfelder and Anna Scheuernstuhl followed the invitation of Prof. Dr. Brigitte Gaiser und Prof. Richard Linxweiler and talked about the topic »Brand Management – From Strategy to Action« at Pforzheim University of Applied Sciences. For Anna Scheuernstuhl this meant to go »back to the roots«, as she herself is an alumna of the master program »Creative Communication & Brand Management«. In their lecture, the two brand consultants discussed the relevance of brands, demonstrated how brand differentiation works and showed how brand strategy can contribute to that. By means of two selected B2C and B2B cases they then demonstrated, how brand strategies are developed in practice and how their rollout can be successful. A vivid Q&A session ensured a great ending to the visit at Pforzheim University.